Pregnancy causes a number of profound changes to the bodys cardiovascular functioning, and in some cases, these can affect the health of mother and baby. This is especially the case if you had an existing cardiovascular condition before becoming pregnant. The most significant changes to the circulatory system begin in the first trimester of pregnancy and peak during the second. Increase in heart rate by 10-20 beats per minute. Problems typically encountered in the third trimester relate to a decrease in venous return, which can lead to hypotension. Cardiac output can also be affected during this time by the pressure of the uterus on the abdominal aorta, the largest artery in the abdominal cavity. Symptoms that are more unusual and call for a more detailed evaluation include chest pain (angina), shortness of breath without exertion or during the night, and sustained arrhythmia. Heart disease can be safely managed during pregnancy with the help of an experienced and qualified specialist. If you have an existing condition and you are considering getting pregnant, it is advised that you come in for a consultation. If you are already pregnant and would like to discuss any cardiovascular-related symptoms or any symptoms at all that have arisen since conception, please give us a call and make an appointment to meet with one of our specialists. We are here to help with any concerns and to ensure that you have a safe and healthy pregnancy. 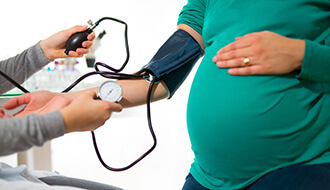 Does pregnancy affect cardiovascular health? Yes, all women will experience significant cardiovascular changes in the first trimester of their pregnancy. These changes will be more noticeable if you had an existing condition prior to becoming pregnant. What are the most common pregnancy-related cardiology issues? Shortness of breath (dyspnea), orthopnea, swollen ankles (oedema) and palpitations are all common signs that women notice during pregnancy; they are all related to how the cardiovascular output is affected. I have an existing cardiac condition but I would like to get pregnant. Is it safe? An experienced specialist can evaluate you prior to becoming pregnant and advise you on the safest way to proceed to support optimal health for you and your baby. Make an appointment to speak to one of our specialists who can support you through the process.